Model 96 FAS Pan Type Steps, 1/2" Sq. Center Baluster, 1" Sq Main Baluster, 2" Rd. Stainless Steel Rail. This fluid spiral staircase was custom designed and assembled by our manufacturing team to fit the architectural and aesthetic requirements for a modern commercial building. 96 inches in diameter and 15 feet from ceiling to floor, the spiral staircase adds beauty to this facility while conserving space. The spiral stair is made from steel with a custom 12 inch center support column. 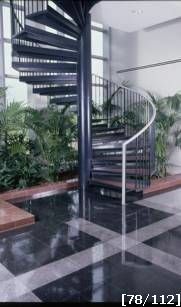 Classic pan type steel steps are inlayed with polished granite slabs which were installed on site. Pan step gussets and brushed stainless steel handrails were custom designed and fabricated by Stairways, Inc. This custom designed spiral stair provides longer durability, more natural aesthetics, and better overall performance than a spiral staircase kit would have offered.